British luxury fashion label, Burberry Prorsum held it's Fall/Winter 2011 fashion show during London Fashion Week at Kensington Gardens on February 21, 2011. Maggie Cheung (张曼玉) attendeded the show among other celebrities like Alexa Chung, Kate Bosworth, Rachel Bilson and more. She opted for a dress and coat from Burberry Prorsum Pre-Fall 2011 collection. I'm not sure if she's wearing leg warmers or pants with the outfit but they looked horrible. I wished she wore the boots like on the runway. Love the turquoise Burberry brights bag she styled with the look. 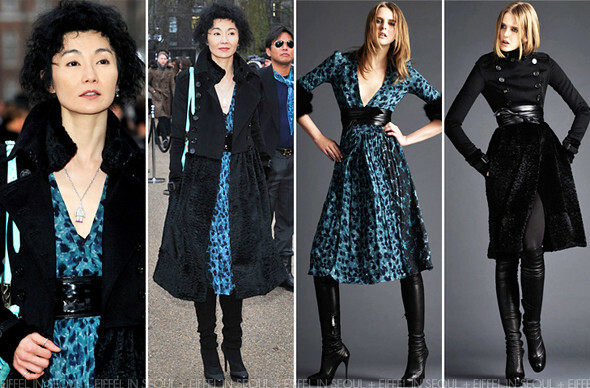 Maggie Cheung (张曼玉) was also seen at Rodarte's fashion show which was held a week ago at New York Fashion Week.